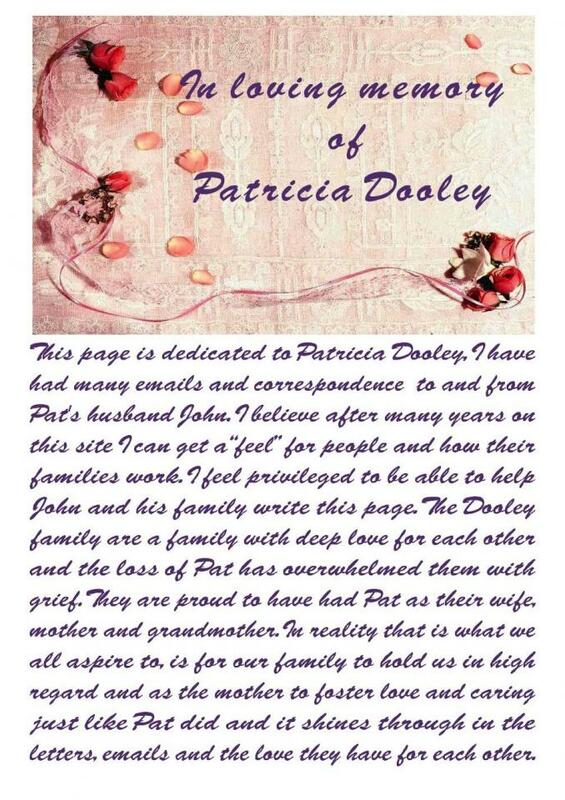 John wrote of his admiration and love for his beautiful and caring wife Pat. Download the memorial image here. Is it only six years since we heard the fatal words, “If I can’t get those tablets, you will be dead within a year.” These apparently insensitive words were spoken to Pat, myself and daughter when we first met with the PAH specialist. We were appalled initially, but later realised that they were meant to shock us into appreciating how serious was her condition. Pulmonary Arterial Hypertension. We knew nothing about this, it was just one of many fancy medical terms. For a while. Until we discovered what it really meant and that it was incurable. The end of a fit life? Yes, but not the end of life itself, not for a long time. Adjustments had to be made, tablets, Bosentan (Tracleer) the life preservers, later Viagra and others appeared. The Bosentan had only been on the market five years and, prior to that, as the specialist told us, you just got your house in order as quickly as possible. Pat started treatment including weekly visits to the lung clinic and other areas for exercises, walks, bike riding and many tests. Importantly, she got to meet other sufferers and their cheerful acceptance belied their illness. It was sad, yet uplifting, to see people in their teens up to retired pensioners all helping each other. Tufty, so called for a cute lock of hair that insisted on escaping from the main body of hair, seemed to enjoy these visits and would come home expressing concern about some of the others, always thinking of someone else. This helped her forget, for a short time, her own situation. This is very important to keep up the spirits rather than dwell on your own discomfort, something she did well. My wife was a fighter. Despite shortage of breath, she insisted on daily walks. I would take her to a high point near home, drop her there and she would walk downhill. I waited at the bottom and we drove home. Although her walking ability deteriorated in the last year, we did manage to visit all her favourite places, UK, Bali, Penang, Dubai (Daughter and family) Brisbane, son and family there and, as late as last June, Casterton, Victoria to visit our eldest daughter and family. She died content in the knowledge that we had made her last years enjoyable, rather than sitting at home thinking negative thoughts. The latter would have been so easy to do, but, as I said, she was a fighter, loved life and her family and never gave in to the disease. Even the day of her death she was bragging to the nurses about her grandkids. It was an important part of her illness, to be able to think of others. 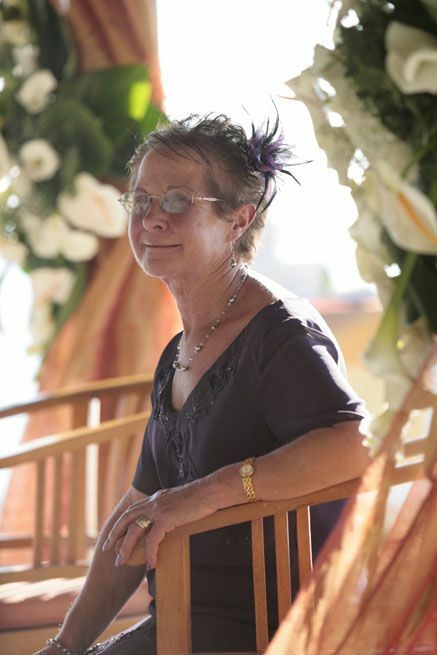 Pat suffered from other disease, Scleroderma, Reynauds, Schogrens, all of which she endured, and, as friends would say, ‘She never complained.” She did complain constantly to me and my biggest regret is that, not being a carer, I would often tell her to be quiet and stop it. I regret those words every day since her death and would love to have her here just for a short time to say sorry. Put yourself in your partner’s shoes, how would you feel? She was considered to be the ‘Health Queen” by our kids, yet she was the one who had all the ailments, not me, a bit of a junk eater! As I said in my eulogy, however bad you may think your relationship is, however many times you wish it were better, at least you have one. Things could be worse, look at me! I told the people present to turn to their partner, give them a hug, kiss or say ‘I love you’ They all did! In Pat’s memory, a beautiful thing to do. Please , whoever reads this, make sure you do or say these things daily. Tell your kids you love them, they were my rock after the funeral. It will help your relationship. Make the most of your time together, we did. Pat was taken ill on Monday, we took her to the lung clinic that afternoon and she died peacefully the next evening. Too soon and, sadly I was not at the bedside, having left the hospital briefly. My kids were there and it was thanks to them and the remarkable, patient nursing staff, that she died feeling loved. And still is. 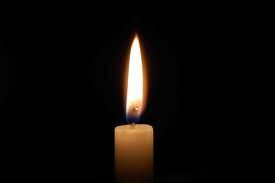 Search under our group, PHAA, to see if therre are any current candles or feel free to light a candle and where it asks to associate with a group type in PHAA and we will all be grouped together.